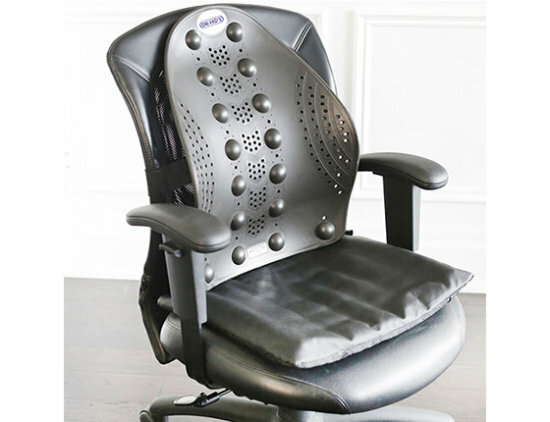 The Air Wave Cushion is a special anti-pressure cushion you can place on your chair to make seating much more comfortable for your hip and your lower back. It helps to equalize pressure across the entire seating area. 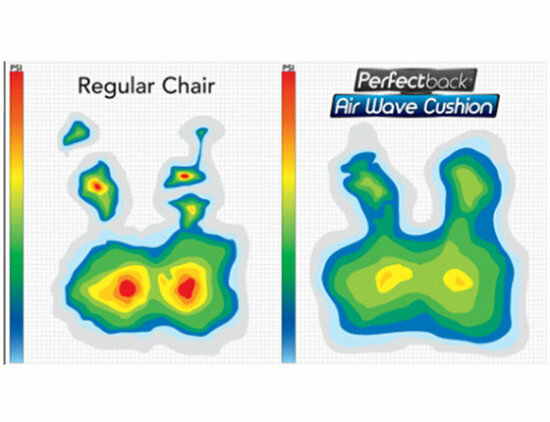 This is how it works; the Air Wave Cushion is a network of large number of small cushions with air channels connecting them. Suitable for all types of chairs, it is recommended to all who sit a lot; in the car, at work, at home, in wheelchairs, people with hemorrhoids, pregnant women ... etc. When you sit on this cushion, air will automatically flow within these smaller cushions to equalize pressure throughout the seating area. Whenever you move or shift in your chair, the cushion will self adjust to contour itself to your buttock and upper leg to provide the perfect fit and extra comfort. This cushion is designed for people who sit for long hours. It can provide extra comfort for office chairs, in your car, dinning chairs, sofa chairs, sports arena benches, at park benches, on wheel chairs and even for people who sit on the floor. It can turn any seating area into the most comforting, self contouring and shock absorbing surface. The Air Wave Cushion is designed to allow freedom of movement in your hip and lower back to help maintain joint motion, muscle activities and circulation. 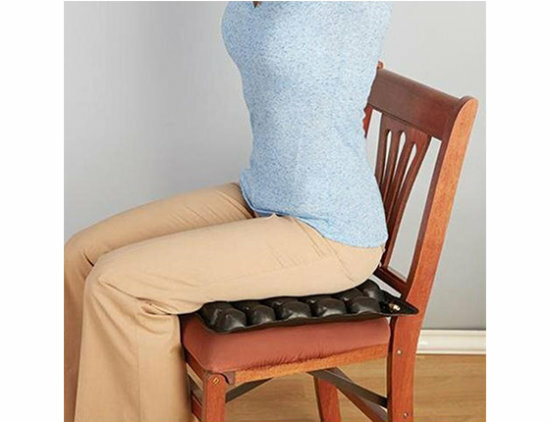 When you move gently while sitting on the Air Wave Cushion, it can help to ease back pain, hip pain, muscle tension and joint stiffness in the hip and lower back. 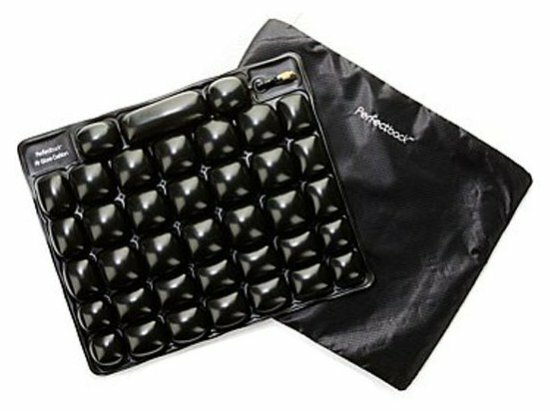 The Air Wave Cushion can be use on your bed to provide good support for your lower back, highly recommended for anyone who gets sore and stiff back from laying down. 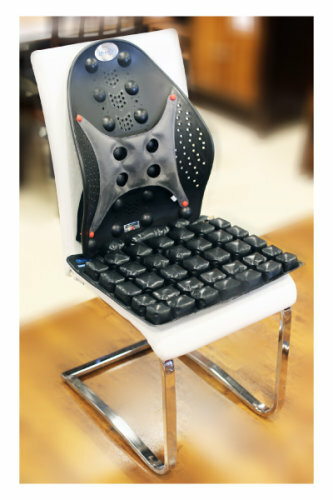 You can adjust the pressure to customize the amount of support and movement you like best. Instrucion Manual comes with product. The cushion comes with non-slip cover.